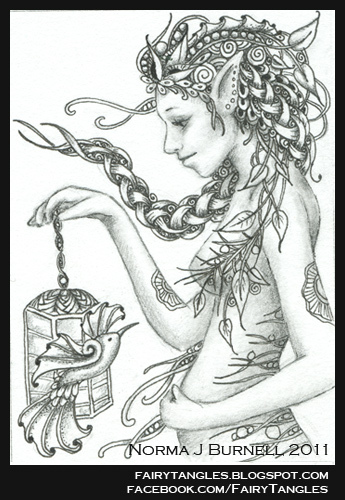 I'll be giving away one of my Fairy-Tangle original ACEO drawings on January 31, 2012. All those how have "Liked" my http://facebook.com/FairyTangles will be eligible (sorry, no relatives) The winner will be contacted privately. Here she is, my give-a-way. I'll be picking the winner tomorrow. 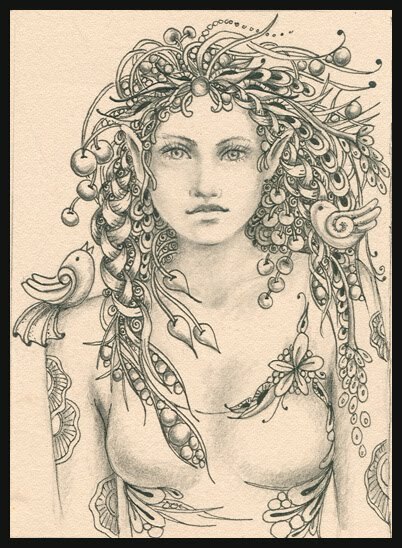 "Meadow" ACEO, 2.5 x 3.5 inches, Ink and graphite on Bristol board. 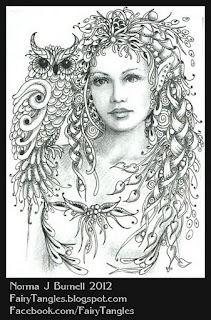 Here's a new ACEO, micron pen and graphite on bristol board. 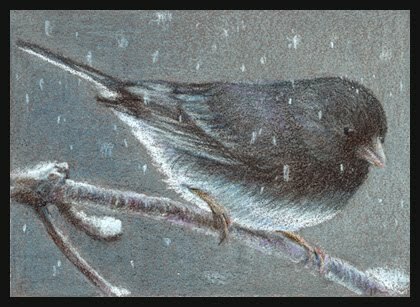 In honor of our first snowfall..."Snowbird" ACEO, 2.5 x 3.5 inches, Prismacolor on Art Spectrum Colourfix paper. Dark Eyed Junco. The snow really brings these little guys out of hiding...so chubby and cute hopping in the snow! 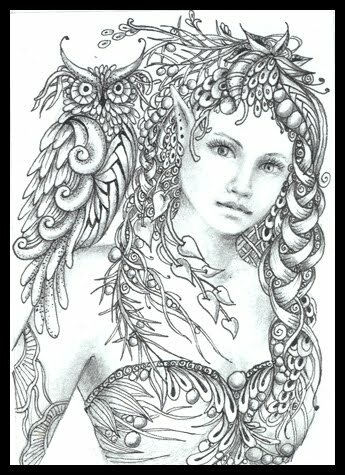 All this cold weather makes for good drawing days :o) Introducing "Caelia, The Woodland Queen'. 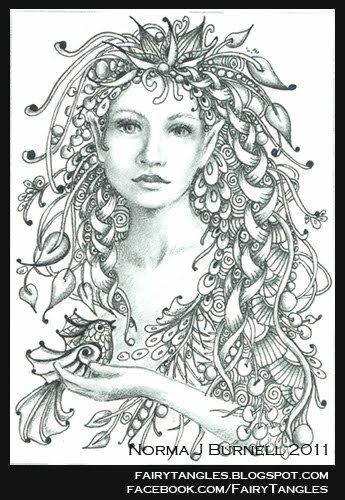 Caelia is ACEO size, 2.5x3.5 inches and is drawn on Stonehenge paper with micron pen and graphite. The great Queen. Goddess of birds and horses. Enchantments, fertility and the underworld. 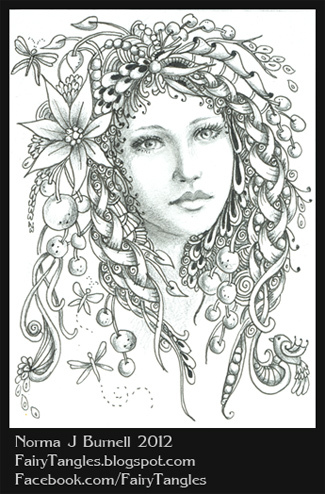 ACEO, Micron pen and graphite on white Stonehenge paper. 2.5x3.5 inches. Speaking of birds, there has been several Snowy Owl sighting in the area...so I'm off of a search...going to try and see myself one...such beautiful birds. 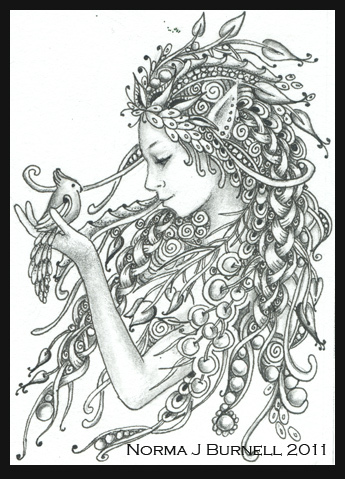 I'm taking my friend, TJ's advice and naming this one "Fedelm" - Irish faery prophetess to Queen Maeve (Medb). 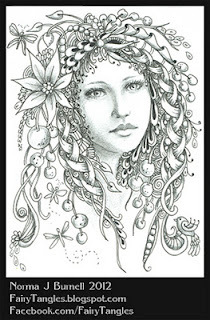 Fedelm is ACEO size (2.5x3.5 inches) and is drawn with micron pens and graphite on tinted Stonehenge paper. New Year's Cardinal - finished this one on New Year's Day. 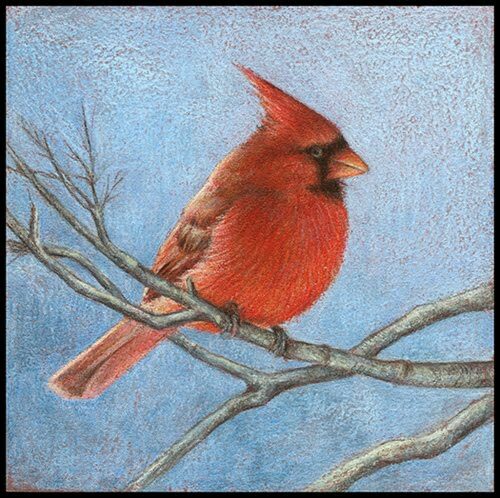 5x5 inches, Prismacolor pencil, on Color-Fix treated art board and touched with a bit of turpentine to "melt" the color pencil. I'm having too much fun seeing what the turpentine does to the pencil - I can see lots of possibilities to playing with this technique.